On display is a selection of wire sculptures created in 2005 for New-York Historical’s landmark exhibition Slavery in New York. While research at the time uncovered the names of the first Africans brought to New Amsterdam by the Dutch in 1627 as slaves, there was no way to ascertain these peoples’ actual physical details. In fact, not a single image of a black New Yorker survives from the period before 1796. Brooklyn artist Deryck Fraser was commissioned to develop a series of wire sculptures that would evoke, rather than represent the city’s earliest Africans. For the most part, the sculptures conveyed the work in which these early Africans were engaged—hefting timber and carrying a load of wood. The reinstallation of five of these sculptures pays tribute to these early enslaved New Yorkers, who bequeathed so much to us, including some of the most visible landmarks of our city, for example, the Wall on Wall Street and Trinity Church. 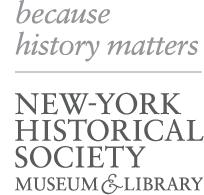 Major funding for New-York Historical's Equality and Justice for All initiative, exploring the history of identity, race, and civil rights in America, has been provided by The New York City Council with support from Council Member Helen Rosenthal and Council Speaker Corey Johnson, and by Empire State Development and the New York State Council on the Arts under Governor Andrew Cuomo's Regional Economic Development Council Initiative.